Condair’s JetSpray humidifier is helping abattoir equipment specialists, GM Steel, reduce carcass moisture loss after slaughter by up to 1.5%. By maintaining a consistently high humidity in the chill down area, GM Steel has been able to reduce the moisture loss of a carcass from around 2.5% to less than 1%. 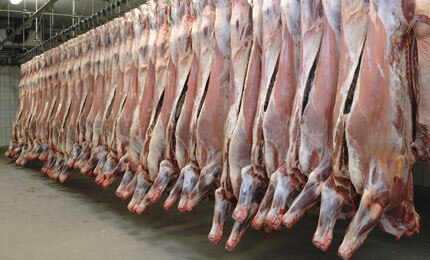 For an abattoir processing 3,500 carcasses per week and an average cost of beef at $4/kg, this technology could increase profits by over $2M per year by preventing over 500,000kg of beef simply evaporating into its chill store’s atmosphere. Robert Ten Cate, consultant at GM Steel, explains the process, “A carcass coming from the slaughter line is wet and warm. When it is introduced to the chill store, the cold dry air strips moisture from its exposed surface. The amount depends on the abattoir’s cooling technology but it can be anywhere between 1.2-2.5% of its total weight, and sometimes even more. By maintaining a high humidity in the chill store with a JetSpray humidifier during the initial cooling, moisture loss from the carcass is inhibited and can be reduced to less than 1%. 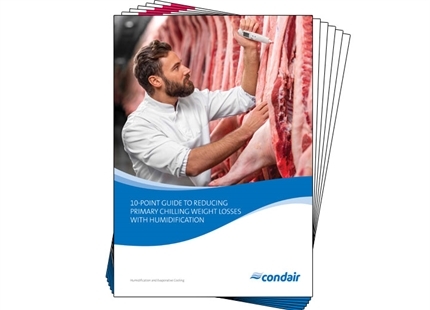 “Independent testing has shown that by maintaining the optimum humidity during cooling, carcass weight loss is reduced without any condensation forming inside the chill store or on the meat. Humidification of the air does not introduce moisture to the surface of the carcass or increase microbial growth. Robert continues, “In fact, client tests showed that the high humidity actually reduced microbial growth rather than promote it. The higher humidity improved the conductivity of the air and consequently increased heat transfer from the carcass. Some installations have seen a significant reduction of their chill cycle to reach the required carcass core temperature. 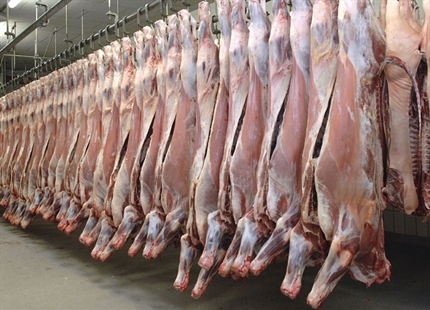 As the carcass temperature is reduced more rapidly the microbial growth is inhibited. “Another significant benefit of a quicker cooling cycle is the reduction in energy consumption of the cooling system. Clients have seen energy bills reduced by as much as 10% when maintaining an optimum humidity in the chill down area due to improved heat transfer efficiency from the carcasses.” Robert concludes. The JetSpray humidifier consists of rows of precision engineered nozzles that combine compressed air and water to produce a spray that has a droplet size of just 7.5microns. 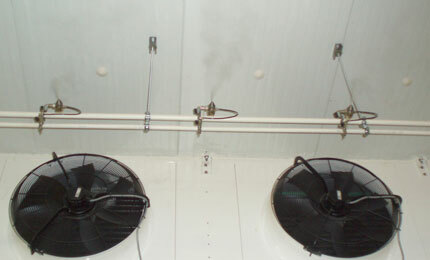 The nozzle line is mounted directly in front of the evaporator coils of the refrigeration system and introduces moisture to the airstream as it enters the chill store. The extremely fine spray ensures the moisture is absorbed by the atmosphere and prevents wetting inside the room. The flow of compressed air also avoids the possibility of drips. 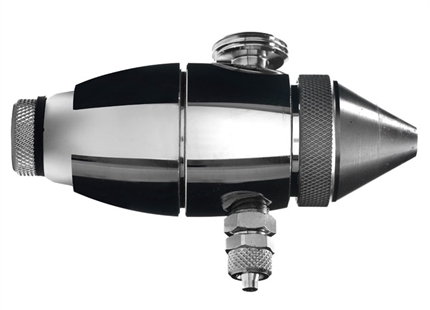 Tiny needles inside the nozzles act as a self-cleaning mechanism and prevent blockages making the system extremely robust, requiring very little maintenance. The JetSpray humidifier has been developed with hygiene as a principal design factor making it ideal for use in food processing facilities. A reverse osmosis water filter removes all minerals from the supply water before it is treated with ultraviolet sterilization to kill any remaining microorganisms. In addition, the system will regularly run purge and flush cycles to ensure water cannot remain in the humidifier to stagnate. 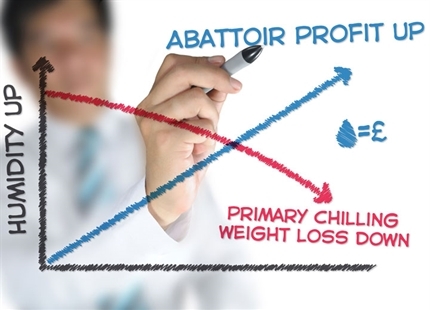 Get a personalised ROI calculation on humdifying your abattoir. Click here. 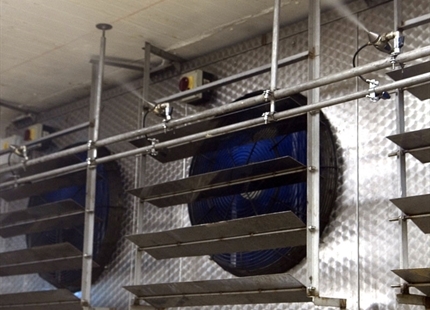 Complete the form to get a personalised ROI projection for humidifying an abattoir's primary chilling area. Reducing weight loss during carcass chill down to less than 1%.